Sold by the pound with a minimum order of 30 lbs. BRS Pukani Rock is by far our customer’s favorite rock. 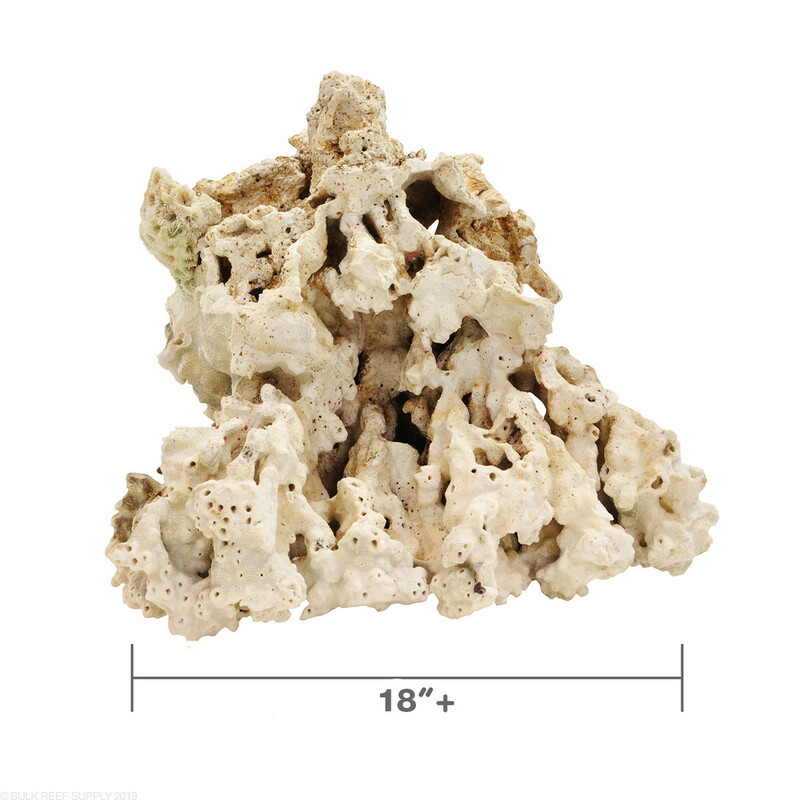 It yields the most volume per pound compared to other styles of rock, with tons of nooks and crannies for corals to be placed and small critters to hide out. BRS Pukani Rock is pest and algae free to give the best start for any new tank. It also has the ability to be shaped, drilled, or cut depending on the aquascape it will be used with. Pukani is available in a wide variety of sizes. 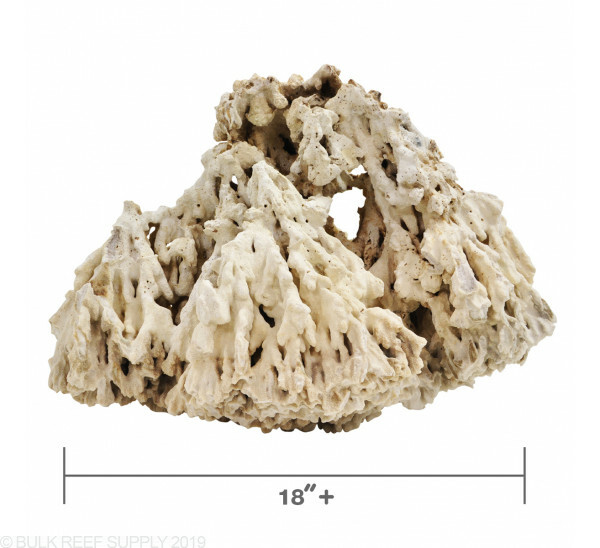 BRS Pukani Large 18+" Dry Live Rock is generally 18" or more in diameter. Sold by the pound with a minimum order of 30 lbs. 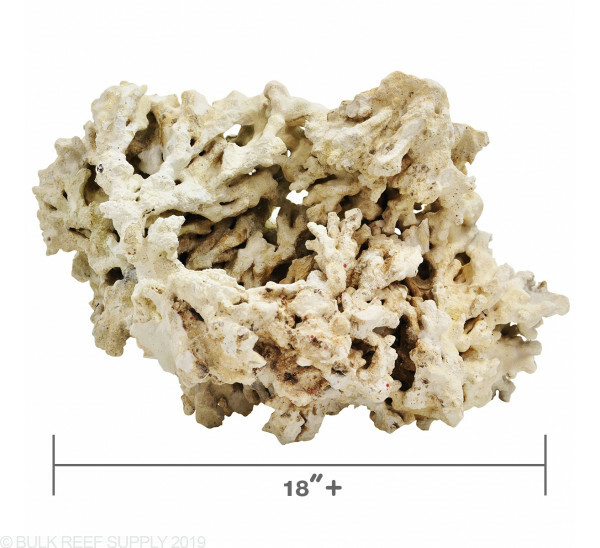 BRS Pukani Dry Aquarium Live Rock - our lightest and most porous and full of holes that become nice homes and passage ways for your tank's inhabitants. Like all of our dry rock, Pukani is free of nuisance algae and pests which can cause complete tank shut downs. It is guaranteed to be free of apitasia, bubble algae, parasitic isopods, mantis shrimp, acro eating flat worms, little red bugs, fire worms, predatory nudibranchs, pyramidellid snails and other common pests. Low initial cost on premium types of rock. Pound for pound a way better value - no water weight. Can be shipped standard UPS ground which saves a fortune on shipping. Absolutely pest free. This is the most important reason. This allows you to completely avoid all of the most common aquarium pests that plague most aquarists. Knowing exactly how much Dry Live Rock you will need can be one of the hardest questions to answer since every tank and rock will be slightly different. 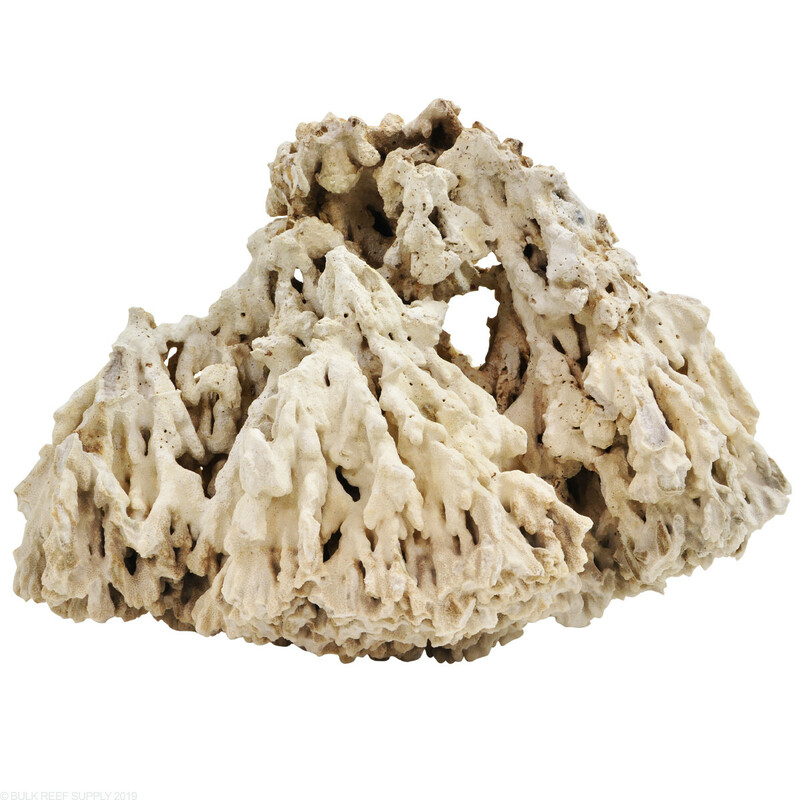 A general guideline for Pukani Dry Live Rock, we suggest 2/3 pounds of rock per gallon of display tank volume and may vary depending on your overall goal for the aquascape. 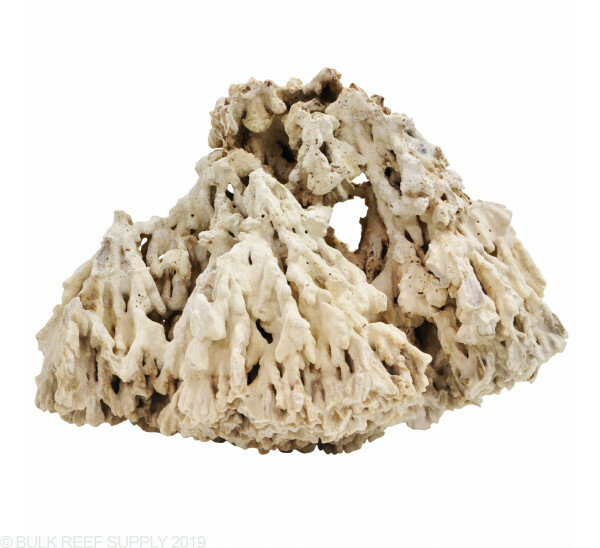 We always recommend purchasing a little extra dry rock to ensure that you will have enough to complete the aquascape you are looking for, any extra rock can always be broken up and placed in your refugium, overflows, and sump for added filtration. BRS makes every effort to securely pack the Rock. However, the UPS automation is not always gentle on heavy products like this and they do not consider this product insurable. Because of this, there is some inherent risk with shipping rock like this across the country and it is impossible to replace or refund broken pieces. If this happens most pieces can be repaired with epoxy. NOTE: This rock does come out of the ocean and may have some dead material on it such as sponges or other critters. 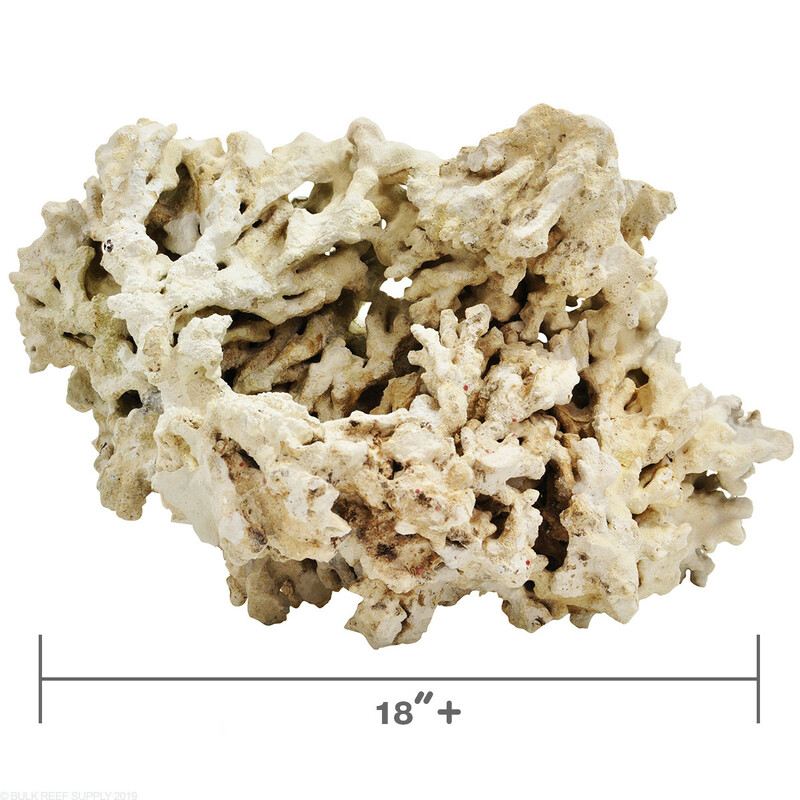 We strongly suggest soaking or curing the rock before use in an active aquarium. Dry live rock is not available for shipment to Canada due to high tariffs. Please consider Reef Saver rock as it is not subject to these fees and is our favorite of the dry rocks available. Ordered 50 pounds and got two huge pieces, they look amazing. Thank you BRS, very happy! Very nice rock. Came as one giant rock in the box. Cool shape. Ordered 70lbs. I'd say that there is about 70 here. Recieved 4 pieces. 2/4 are awesome. And right aroumd the 18" size. 1/4 is large and unique but not as porous. I still think I can do something neat with it. And the last 1/4 is close to 2' long, 1' tall, and 1' from front to back. Not very porous either, but has one fascinating end. Ill place that end facing front of tank and will look amazing. All in all, I would buy this again. 30lb ordered, 35lb received as a single 22"x13'x13" rock in perfect shape thanks to immaculate packing. The upgrade to 3-day shipping was inexpensive and the rocks shipped immediately so were actually received in 3 days. 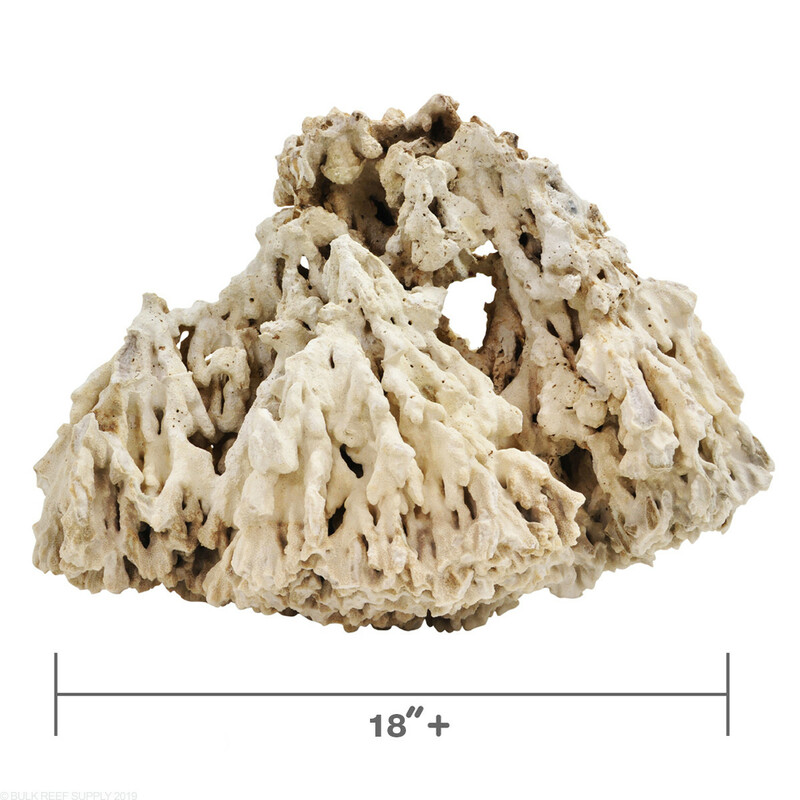 This is the perfect density & shape of rock for aquascaping. Ordered 30lb and received one ~35lb large rock. 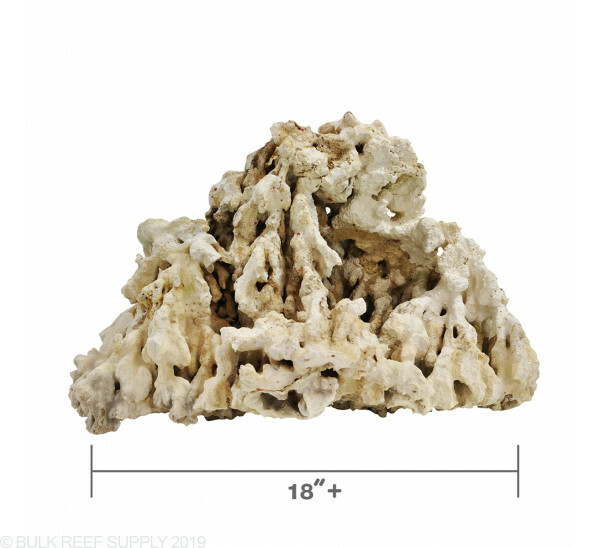 This rock has the perfect shape and texture for aquascape, about 22x13x13, and was immaculately packed for shipping so no breakage during transit. Received a huge odd shape piece just as requested...cured the rock in short time using a special process, not acid. 2nd huge piece ordered for me, happy both times. I ordered rock for my new 300gal tank and wanted some large base rock. The rock I received was impressive, to say the least. One piece measured over 20" across and has an amazing shape and so much character. It looks pretty clean for dry rock (I expected more dead organic material, but was pleasantly surprised). The rock also survived shipping very well with minimal damage. Would recommend! Hi, just want to make sure if I want two of these, I just add 60lbs to my cart, correct (or simply multiples of 30lbs for each I would like)? Thanks for asking, and yes for two rocks just add 60lbs to your shopping cart and when checking out in the Order Comments sections just add "Two Pieces" or "Two Rocks". I have a 150 gallon X-high tank. Dimensions are 24 depth x 48 width x 31 height. Approximately how many pounds should I order to fill this aquascape? 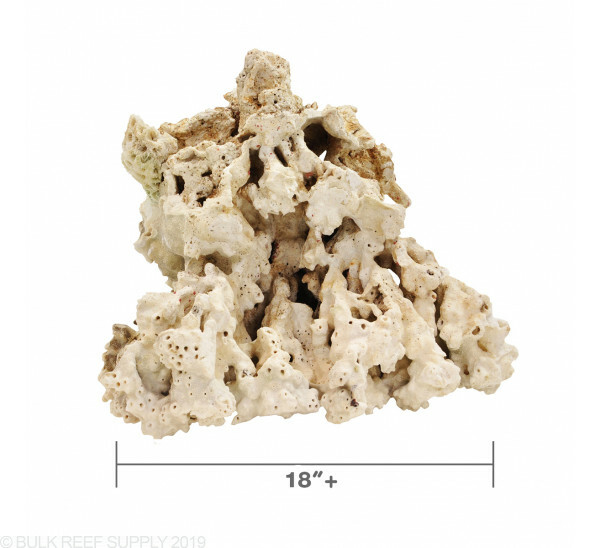 The exact amount of rock will vary depending on your aquascape and personal preference, but for Pukani we would typically recommend about .5 to .75 pounds per gallon of display volume as a rough rule of thumb. If you want to have a few extra pieces to play around with for more options, there's little harm in purchasing some extra. Is there any problem curing the rock in a new tank setup that has nothing it is as of yet? Should I just soak them first before they enter the tank? While it certainly is possible and many people do this with new tank setups, you should be aware that you will be releasing a fair amount of organics/waste into the display tank as dead material breaks down from the rock and dissolves in your display. I would plan to do a large water change at the end of the curing process prior to adding any initial livestock. Check out the videos at the link below! I just want 3 or 4 big pieces but don't know how many pounds that would be. if u could help I would greatly appreciate it.